The 2019 first quarter started out with dark clouds and ended with some sun breaking through the clouds. In early March, the Atlanta Fed’s GDP Now forecasted less than 0.5% growth for first quarter GDP growth. Only four weeks later, their first quarter forecast jumped to 2.3%. Many economists showed a similar upswing in their forecasts but not as high. The range of the blue chip consensus forecasts compiled by the Atlanta Fed now ranges between about 0.7% and 2.4%. The end of the partial government shutdown, the increasing probability of settlement of the Sino-American trade war, and – most importantly – the Fed’s dovish “we’ll see” stance contributed to both financial market bullishness and to somewhat more optimistic business dynamics. As a caveat, the government’s first quarter seasonal adjustment quirks will make the results less reliable for forecast purposes. Most economists see GDP growth reaching above 2% in the second quarter. In the second half, U.S. economic growth will likely trend down to roughly 2%. That rate approximates the economy’s potential growth rate. Normally, housing would not be showing renewed strength late in the economic cycle. 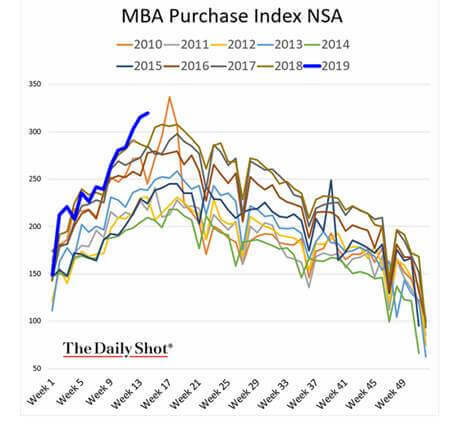 Surprisingly, the dovish Fed and the resulting lower long-rates seem to be producing stronger housing demand than normally expected. As evidence, mortgage applications for house purchases recently picked up (see Figure 1). If these early signs of housing strength prove more than a blip, then, with the seasonally important housing market coming up, it could boost currently modest expectations for second and third quarter GDP growth. The rapid rise in house prices may create an affordability issue limiting a long-term recovery. Normally as recessionary concerns broaden, credit spreads widen in anticipation of increasing credit risks. 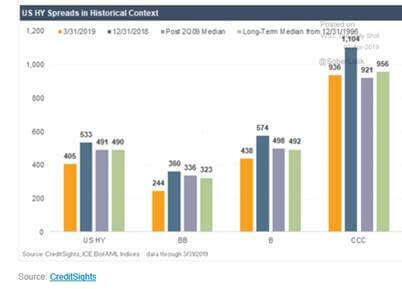 Instead, since the end of the year, high yield spreads narrowed (see Figure 2). 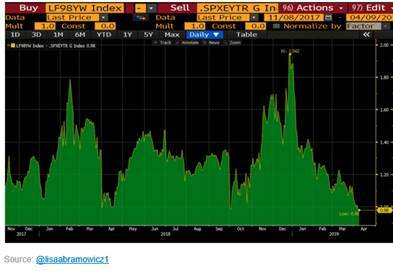 Because of the narrowed spreads, the gap between U.S. high-yield interest rates and S&P earnings yields also compressed (see Figure 3). This narrowing, in our view, helps support our continued view that few economic excesses exist that might lead to a near-term economic decline. While economic data shows slowing growth, we still do not expect a recession happening this year. 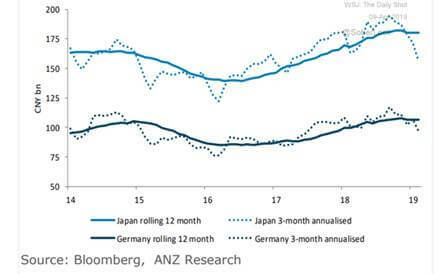 At the same time, the normal lagging effects of monetary policy from last year’s less accommodative monetary policies may show up at year-end. If that proves true, then looking into 2020 may bring increasing economic clouds. In our view, it remains too early to reach such a conclusion. Looking forward, settlement of the trade war will likely prove one key to the economic outlook for the remainder of the year. Without a settlement, the economy and markets could lose their momentum creating greater potential for weakness by year-end. That will prove true not only for the United States but also for global growth. The trade war has broadly affected export volume growth worldwide (see Figure 4). 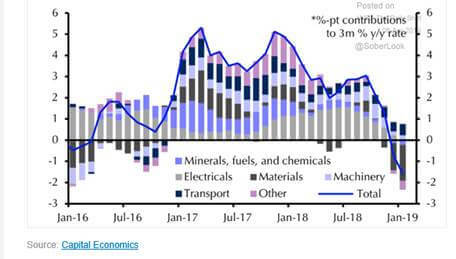 Figure 5 shows recent declines in China’s imports from Germany and Japan. In the case of Germany, the recent IMF forecast reduced this year’s growth outlook for Germany from 1.3% to 0.8%. Any slowing in the German economy will also influence eastern European countries (which the Germans call Mitteleuropa) such as the Czech Republic that act as a supply sources for German manufacturers. The EU also awaits the resolution of Brexit — the longest running British comedy — with its performance run extended through October. Overall, the move away from global free trade, Brexit, and the increasing influence of populism in Europe could change the nature of the pan-European structure. Elections for seats in the European parliament at the end of next month will provide a clue to that possibility. Current expectations call for populists’ parties to increase their representation by as much as fifty percent. A recent article in Foreign Policy titled The New German Question provides a good historic view of the issues involved. 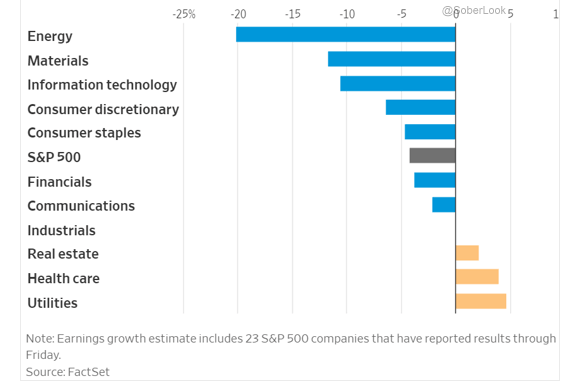 First quarter forecasts call for most industries to show lower earnings — the first decline since 2Q16. Figure 6 shows analysts’ current earnings expectations by industry. Besides slowing U.S. economic growth, earnings of U.S. global companies also will feel the pinch from slowing international economic growth — Federal Express’ reduced earnings expectations represents just one example. In addition, the dollar showed greater year-over-year strength in the first quarter. That strength further erodes non-U.S. earnings when translated back into U.S. dollars. The earnings outlook for the remainder of the year should improve (see Figure 7). The dovish role the Fed assumed at year-end should provide an environment for growth admittedly at a rate below last year’s levels. Consumers’ financial positions remain strong. The key question — will consumers open their wallets to spend? With the clouds at year-end 2018 gradually dissipating, this will in part depend on resolving the China trade issues. If so, this may encourage consumers to step up their spending. The strength in nonfarm payrolls gives further cause for optimism. The year-end market decline likely caused some upper income consumers to pull back on their spending. The current market turn around could also cause them to open their wallets. Finally, a likely stable to weaker U.S. dollar should boost non-U.S. earnings for U.S. global firms. While the earnings outlook remains more positive for the remainder of the year, companies will likely see their operating margins show a decline from recent peak levels (see Figure 8). 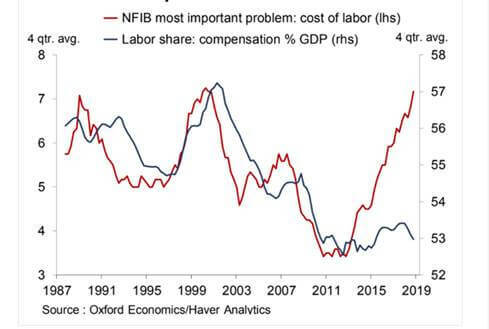 Rising wages will likely bring pressure on margins. This will particularly affect those companies with a heavy labor component in their total operating expenses (see Figure 9). Therefore, the operating profit margin outlook for such companies will depend importantly on whether their competitive environment permits pricing power. Modest levels of price inflation will likely limit the number of sectors that can exercise such pricing power. S&P 500 Peak Operating Margins? As a result of the year-end equity market decline, our December 26th commentary suggested “sharp equity market downturns can create investment opportunities for those investors with liquidity and both the risk tolerance and strong stomach to look over such periods.” Figure 10 shows the bounce back from that period. The strong recovery from the lows usually leads to some market pull back. 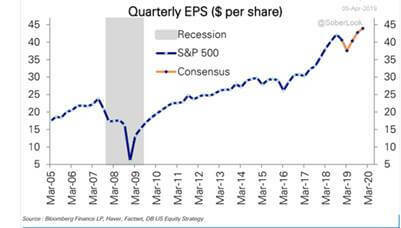 This may show up if first quarter earnings results disappoint investors despite the already cautious earnings outlook. A continued strong upside to equity markets will likely depend on positive surprises to the generally cautious outlook for the economy. In our view, a successful conclusion to the Sino-American trade dispute seems built in to the recent stock market rally. However, successful conclusion of these talks would likely lead to improved business optimism and their increased spending both domestically and globally. 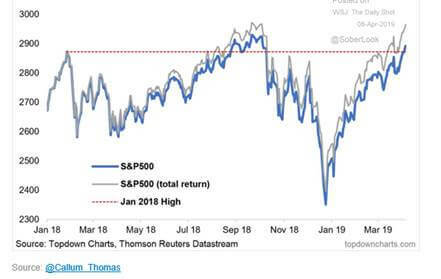 If so, that spending could provide the needed positive economic surprise in the second half of 2019 to sustain a strong market advance.